What does Hero Alom’s candidacy say about the state of Bangladesh’s politics? There’s no dearth of cringe-worthy YouTube and Facebook videos in Bengali cyberspace, but few match up to Hero Alom’s audacity. His off-key singing, klutzy dancing, garish clothes, production values, scripts — every part of his work is a screaming sacrilege to even the most base forms of art. And everyone knows it. But Alom appears to be well beyond the human capacity of being shamed into stopping what he does. In fact, he thrives off an unflinching shamelessness and has produced over 300 such videos and songs; many have view counts running into several million. In November, Alom decided to cash in on his YouTube and Facebook popularity by deciding to run for office in the upcoming Bangladeshi general elections. His nomination was rejected by the Bangladeshi Election Commission, but here, too, there was no stopping him. Alom took the Election Commission to court for unfairness and won his nomination back. He is now contesting the upcoming general elections on December 30, 2018. “All I can say is, you can’t turn Hero to Zero,” Alom says, opening his interview with me over the phone from his home in Bogra, Bangladesh. It’s a practiced line — one he’s delivered at several press conferences. His words are soft, unchallenging and there’s a quiver of uncertainty belying his trademark overconfidence. Perhaps it’s the fact that this is his first interview with a foreign journalist, or perhaps like a true troll, he doesn’t quite believe what he tells the world. Narrating his life’s story Hero Alom, real name Ashraful Alom Hossain, says he still lives where he was born — Bogra, in the Rajshahi division of Bangladesh. He’s the sole income-earning member in his family, which consists of his wife and two pre-teenage children. Having studied up to just grade seven, Alom had no prospect of landing a job. So he started up a DVD rental business. With the advent of Direct to Home satellite TV, he became a franchisee of Dish TV. He would watch hours of movies — especially those of Shah Rukh Khan — he said of his journey to becoming Hero Alom. “Who makes these videos,” I ask him. “Myself of course!” he replies. With a little help from friends, he began shooting his videos on handheld cameras and later mobile phones. To date, his videos remain self-produced and self-financed. “Dancing talent” is a euphemism for the women who gyrate seductively around him in his videos. This is Alom’s second go at elections. The last time he tried winning a place in the local self-government, he lost. For the 2018 general elections, Alom had first been backed by the Jatiya Party — a party led by the former military dictator, General Ershad. But the Jatiya Party withdrew its support and offering no explanation issued a press statement saying they never had any plans to give Alom an election ticket. Having tasted success in the newsrooms of TV channels, Alom wasn’t turning back. He went ahead and filed his nomination as an independent candidate. The incumbent parliamentarian from Bogra belonged to the Jatiya Somajtantri Dol (National Socialist Party). Currently, a staunch ally of the government, the National Socialists have withdrawn its candidate in favor of one from the ruling Awami League. The main opposition party, the Bangladesh National Party, also has a candidate in the fray, but neither of Alom’s competitors has the name recognition value that he does. If clicks and views are a metrics to go by, Alom is certainly more popular than any other politician or political party in Bangladesh. Started in February 2018, Hero Alom’s official YouTube page — which he manages by himself — has more than 207,000 subscribers and a total of more than 25 million views. The Awami League’s official page, run with a significantly bigger stash of public funds and managed by a professional IT cell, has about 48,000 subscribers and just over 9 million views. Other Bangladeshi parties aren’t even on YouTube. Alongside politics, Alom has sparked a debate in Dhaka’s art circles. Dr. Dipti Datta, scholar and faculty of Fine Art refused to take a stand on this. India’s Dhinchak Pooja, with her 437,000 followers and over 78 million views, and Pakistan’s Taher Shah, with his 4 million views, are both monuments to bad singing. Alom has also latched onto the victimhood narrative well. He deflects most criticism of his work by saying he’s being attacked for his looks and poverty. It’s not only the braggadocio of being a self-made man, or deflection of criticism claiming victimhood, which Alom shares with the American president. It’s also the way he went from being a side joke who couldn’t possibly be taken seriously, to a mainstream media phenomenon who TV channels brought on for prime time talk shows, on to becoming a candidate they now can’t shake off. “He’s the perfect troll candidate,” Liton Nandi, a student leader at the Dhaka University tells me. He’s the secretary of the Chatra Union, the student wing of the Communist Party of Bangladesh. “He’s nothing like Trump,” Dr. Fahmidul Haq, argues. Haq is a professor at the Department of Mass Communication and Journalism at the Dhaka University and has authored scholarly analyses of social media and its interaction with Bangla politics and society. Haq is correct in his observation about how attacking Alom from an elitist pedestal has been counterproductive. Ekattor TV, a leading private channel known to be pro-Awami League, invited Alom on a prime-time talk show. But the interaction turned sour when the anchor attacked Alom, calling him at best a clown who entertained people but lacking the gravitas to be a member of the national parliament. This led to widespread condemnation on social media of both the channel and the anchor and ended up generating a sympathy wave for Alom. “Irrespective of what he does or how he does it, he has every right to contest elections,” Abu Rayhan, an undergraduate student at the Dhaka University said. Students of the university had given Alom an impromptu reception and Q&A session the day before. Alom has dreams of winning, but no formal manifesto or real plans about what he’ll do after winning. He wears that lack of plans on his political sleeves. This lack of concrete plans seems to sit well with some sections of the middle class and certainly many online. Haq’s analysis sits on solid political reality. 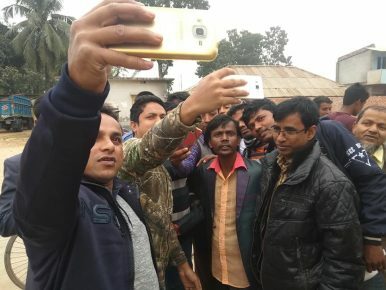 Given the censorship and control exerted by the last military government, blogs written by non-resident Bengalis had become a rallying ground for pro-democracy sentiments. Feeding into ground movements they paved the way for the installation of the Awami League-led Grand Alliance in 2008. Post-2008, blogs, with the new addition of Facebook, once again became the place where anti-Islamist, progressive youth found a voice. Jamaat-e-Islami, Bangladesh’s largest hard-line Islamist party, was heavily invested in the media business of Bangladesh and wielded an influence over public discourse that was disproportionate to their vote share. This led to an undeclared moratorium on talking about war crimes committed by Pakistan aligned Islamist militias — many of whose leaders were then in the Jamaat and held important posts. The blogs and microblogs with their organic and instantaneous reach operated outside the sphere of Islamist influence. These posts led to informal gatherings, the gatherings to what became the famous Shahbag Square movement, and the ensuing reopening of the War Crimes Tribunal and the banning of the Jamaat-e Islami. But no sooner had the Awami League settled into power, they decided to reign in Bangladesh’s “unruly” social media. “The Awami League government wants to surveil all young people — they fear the youth and their refusal to give unconditional obedience,” Haq continued. In the summer of this year, Haq was attacked and grievously injured by thugs of the Chattra League (student wing of the ruling Awami League), for posting condemnations of brutal police action on university students. Alom has become an unlikely hero even beyond the discourse of free speech and internet regulation and has found allies among other candidates whose nominations had been rejected by the Election Commission. “The Election Commission, which is carrying out this so-called verification of legitimacy for candidates, is itself an illegitimate entity,” a senior leader of the Bangladesh National Party said. Concerned about violent reprisals from the ruling government, he requested anonymity. Before the transfer of power in 2008 from the caretaker (military) government to the civilian one led by Awami League supremo Sheikh Hasina and her Grand Alliance, all major parties and the armed forces had signed an agreement saying that whenever the time came for elections to be held, an interim government would be put in place and the incumbent would resign. This would ensure free and fair elections. But citing threats to national security from Islamists, the Awami league went back on that promise and for the upcoming 2018 elections, the Election Commission remains full of partisan appointees with questionable neutrality. Opposition parties are crying foul over scores of nominations being rejected by the Commission on flimsy grounds. Alom and his rejection have put him at the eye of this other storm. On December 30, Bangladesh goes to the polls. There is a real danger of political regression.